Cottages at Hillcrest Landing community is sold out and is not in active development by builder. If you are interested in Cottages at Hillcrest Landing or similar new home communities, contact us today! Our agents are very familiar with new and newer construction in Virginia Beach, and can identify resale opportunities in Cottages at Hillcrest Landing, as well as builder inventory available in nearby or similar communities in Virginia Beach. To view more pictures, interactive maps and the full, detailed description of the Cottages at Hillcrest Landing community, please Login. Cottages at Hillcrest Landing has houses for sale in its new construction development. Each new home in this picturesque alcove of Virginia Beach, VA, is built with attention to detail. Located in a convenient part of Hampton Roads, this community is minutes away from military bases like NAS Oceana, the Coast Guard Finance Center and even Joint Expeditionary Base Little Creek-Fort Story. Shopping, dining and attractions are close by as well, which can lead owners to participate in an active lifestyle. The 15 home sites range in size from 12,000 to 19,000 square feet in Cottages at Hillcrest Landing. Quality and craftsmanship factor into building this new construction. Harsh Tidewater climate conditions make it imperative to construct homes built to weather well here. Builders have used tapered columns, bricks, stones, cedar shakes and vertical siding to achieve not only aesthetic beauty but also durability. These houses for sale can set a homebuyer’s mind at ease. One of the best things about living in new construction in this part of Virginia is that the excitement never stops. Virginia Beach offers so many amenities there’s never a dull moment. Shoppers can leave their new homes and go to the Landstown Commons or Dam Neck Square Shopping Center. Golfers can head to the Honey Bee Golf Club and Stumpy Lake Golf Course. Kids will love getting their fill of water at the Ocean Breeze Waterpark. Everyone can head to the Princess Anne Recreation Center for some swimming, racquetball, dancing and more. How many houses for sale are near this much fun stuff? Homes in Cottages at Hillcrest Landing are where all the action is. 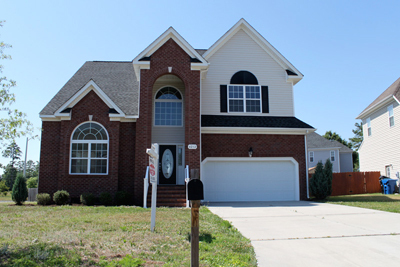 In Hampton Roads there are many houses for sale, so it is important not to worry and take things one step at a time. Step one, tour new construction developments and see if they meet your needs. Step two, come over to Cottages at Hillcrest Landing to see how they measure up. Step three, get ready to purchase that new home! Send me more information about communities similar to Cottages at Hillcrest Landing. Our agents gladly offer FREE property tours of Cottages at Hillcrest Landing, Virginia Beach and homebuyer consultations to all serious buyers.